Background: Rapid Cognitive Decline (RCD) in Alzheimer’s Disease (AD) is associated with a worse disease progression. There is no consensual predictor of RCD and only a few studies have focused on RCD in late-onset dementia, the most common form of AD. Objective: To identify the predictors of RCD, in a population of community-dwelling patients with recently diagnosed late onset AD. Methods: Community-dwelling subjects aged >75 consulting for the first time in Old Age Memory outpatient center from 2009 to 2012 were considered. All patients underwent a standardized clinical dementia investigation. Patients were classified as rapid decliners when they demonstrated a loss of 3 points or greater in MMSE during the first six months. Results: 130 patients were included (42 males, 88 females, mean ages 82.7±4.58). The average baseline MMSE score was 23.36±3.78. 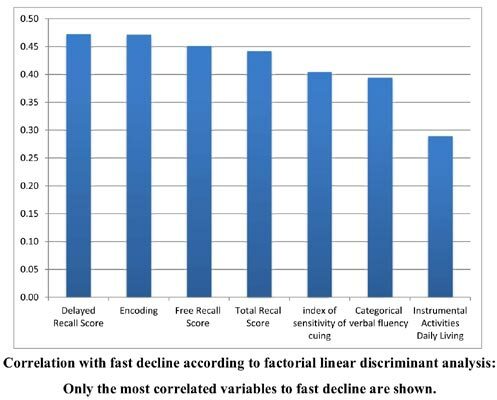 In regression analysis, the Free Recall Scores, categorical fluency scores were the most highly predictive of RCD. Conclusion: These results are important for the design of clinical trials and also, in clinical practice, for both physicians and families in planning long-term care. Keywords: Alzheimer, cognitive tests, elderly, rapid cognitive decline, Free Recall, categorical fluency. Keywords:Alzheimer, cognitive tests, elderly, rapid cognitive decline, Free Recall, categorical fluency. Abstract:Background: Rapid Cognitive Decline (RCD) in Alzheimer’s Disease (AD) is associated with a worse disease progression. There is no consensual predictor of RCD and only a few studies have focused on RCD in late-onset dementia, the most common form of AD. Cannabinoids, Neurogenesis and Antidepressant Drugs: Is there a Link?